A native from Spain, Natalia Pelaz grew up in Valladolid, a mid-size town in Castilia. During her first high-school years, she soon realized that she wanted to become a teacher and help other young people to appreciate the importance of thinking and studying. At the University of Valladolid, she earned the title of Hispanic Philologist. Soon after, and fascinated by the Spanish Literature of the 20th Century, she pursued her Master’s Degree in Spanish Literature, which she earned in 2000. After working as a secretary for a doctor and for a constructor, she took the decision to “jump” to the States following her truly vocation: teaching. 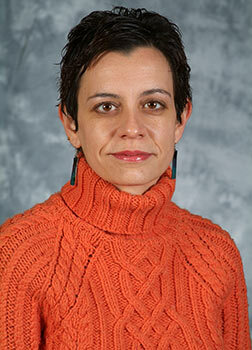 In September 2002 she joined the Department of Romance Languages at the University of Cincinnati. After suffering a tough “cultural shock”, she learned to appreciate her newly hybrid existence. In 2005, she earned her Doctoral Degree in Romance Languages and Literatures. Due to her personal experience, she developed an interest for the literatures of Exiles and displaced peoples. Natalia’s dissertation focuses on elucidating how the condition of exile affects the literary production, and how concepts such as Nation, personal and national identities, memory and language are continually revisited under the condition of exile. To date, Professor Pelaz continues to be very interested in Exile and her attention is focused now in rescuing other Spanish exiled writers that remain in the oblivion.